3 October 2013 – proposed parking restriction changes. 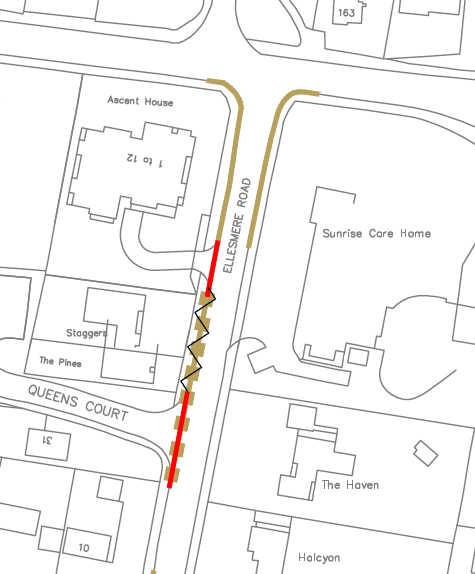 Surrey proposes the following change: extend double yellow lines on western side of road to northern boundary of Cedar Lodge and remove the single yellow line from in front of the dropped kerb fronting Cedar Lodge, The Pines and Tall Trees. Replace the single yellow line from the southern boundary of The Pines with double yellow lines to improve parking provision for residents and sightlines. Red line means “no parking at any time” and brown lines are current restrictions.